Whenever I am down in Ash for the Annual Fete, I always make time to visit your lovely church and one memorial which I always linger by is that to Richard Galen who ministered here during the middle of the fifteenth century. Here he is in full Mass vestments in an attitude of prayer. Situated as it is at the western end of the chancel seems to indicate that he had made a major contribution toward the building or beautification of the chancel. Whether this is so we will never know, for the inscription merely asks for our prayers and for God's mercy on his soul. 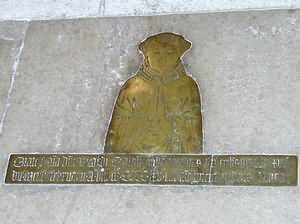 Besides holding the Rectory of Ash, Richard Galen also held the living of Fairford and his will which he made at Ash Rectory on 10th February 1464/5 shows that he was on friendly terms with the Rector of Hartley, Sir John Bownd, for he left three of the six books mentioned in Richard Galen's will, these being his great manual, his processional and his copy of Legenda Aurea in English (in anglice script). He also left a couple of liturgical books to the parish church of Hartley. To the prior and a convent of the hospital of St. John at Clerkenwell he left a number of bequests for the perpetual use of the hospital's chapel which included silver objects, images adorned with precious stones and relics, vestments and two books. To one of his executors, Walter Manby, he left a copy of Florarium Bartholomei. One can only assume what sort of a priest Richard Galen was, certainly he appears to have been a kindly man who not only remembered a fellow priest and hospital in his will but also Walter Manby, whose station in life at that period would be much lower than the rector. Thankfully he did not live to see the iconoclasts who would destroy many - indeed all - of his bequests some seventy years later and for this we must give thanks. Yes, it seems strange that an Anglican such as myself, brought up in a 'low church' tradition and who continues to place more emphasis on Matins and Evensong and the preaching of the Word of God to the taking of the sacraments Sunday by Sunday, that I always make for wonderful memorial to Richard Galen and try to think how splendid the church of SS Peter and Paul would have looked in his day with the Calvery and Rood screen and perhaps even wall paintings. The Church of SS Peter and Paul by John Newman. Monastic and Secular Religion and Devotional Reading in Late Mediaeval Kent by Paul Lee (unpublished).